Here at Tahanan, every week seems to bring with it new adventures, and so while we may be hosting some of the same weekly events or doing the same activities, they are far from repetitive. We have our Tuesday night Bible studies, our visits to inmates, and Saturday night movie nights; with each, we do our best to make them exciting times where people are learning about God in some way or another. Crunch time! Students study during final exams week for colleges in Tacloban. As the school semester is wrapping up here in the Philippines, there are multiple nights with students here using Tahanan as a place where they can come to study for exams, prepare for demonstrations, and work on final projects. We encourage students to use the facility at Tahanan to benefit their educational endeavors in hopes that they succeed academically. Speaking of education, this week we also continued prepping for some of our summer activities, like the Bible class we will be offering. Outside of regular church attendance, many do not have the opportunity to expand their biblical knowledge, and so we are offering a class for young adults to help empower them to be good Bible interpreters, who not only study the Bible, but let their study of it be evident in the way they live out their lives. 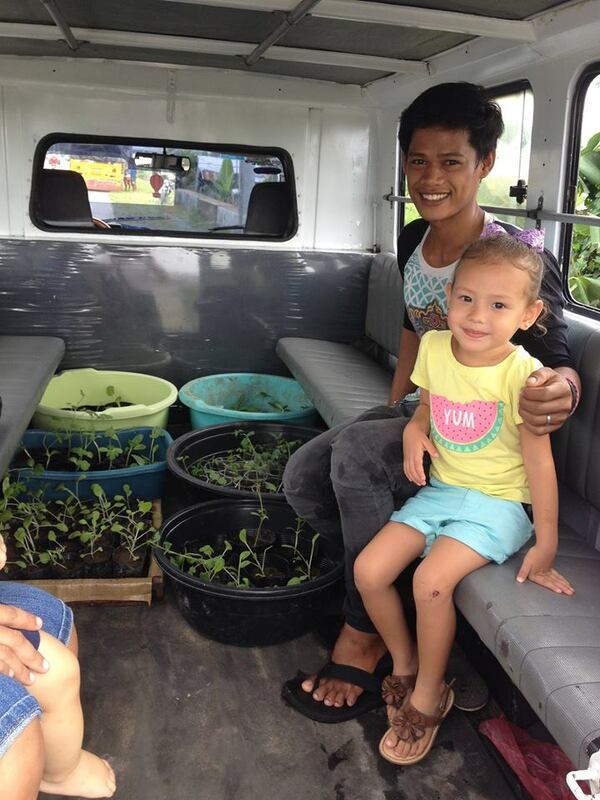 Ayok and Kazeema prepare to transport starter plants to nearby Baras Elementary School to contribute to their school garden. We were also able to continue working on our ongoing food growing program. We put up a bamboo trellis for our beans and then we made a raised bed, a prototype that we will be making more of in the near future, so that we can grow food in areas that would otherwise be difficult to grow. We transferred a hundred plants out of our starters and into pots so as to make a little more room for the hundreds of seeds that we planted this week. But we were also able to extend our efforts even outside of of the garden, as we transplanted over 20 eggplant plants to the local elementary school in order to assist in their food-growing program. Rina was able to put her social work education to good use as we hosted a family who will be making some big adjustments soon. After their father died in December, two orphaned children will now be going to live with some of their older siblings, and so we hosted the family at Tahanan and discussed with the roles and responsibilities that this will bring to them. It was a great week and we are grateful our community center is continually becoming a place that feels like home to many youth in the area.